Florida construction workers face a wide array of unique workplace accidents as a result of their profession. Two major categories of construction accidents are crane and trench accidents. Both types of accidents commonly occur on construction sites and it can be difficult to determine whether an employer should be held liable for a construction worker’s injuries if injured as a result of a crane or trench collapse. Accordingly, it is helpful to consider the recommendations and regulations of an outside regulatory agency like the Occupation Safety and Health Administration (OSHA) to help determine the reasonableness of an employer’s actions in regard to these dangerous conditions. Trenches have many common uses in Florida construction projects including, but not limited to, burying utility cables, serving as a means to set a building foundation, and building connecting waterways. Unfortunately, if not dug properly, trenches can collapse onto construction workers, severely injuring or even killing them. To help prevent trench collapses, OSHA has published recommendations that they suggest companies follow with regards to constructing trenches. These recommendations include sloping trench walls, adding supports to trench walls, keeping heavy construction equipment away from trench walls, and taking note of where any pre-existing underground utilities are. These recommendations can be seen as reasonable guidelines for common practices companies should have their workers follow. If a company does not follow these recommendations, this could be seen a basis for arguing the company was negligent. In the same way, if an employer is following these recommendations, they could use this as a defense to argue they were not negligent. Conducting ground surveys to ensure the ground on which the crane is located can support the weight of the equipment. Properly train workers to use the equipment and ensure they obtain the proper certifications for operating the equipment. This includes ensuring that workers are specifically trained on any tasks they need to perform unique to the company. Ensure that all the cranes used on the site are properly inspected. Evaluate the turning radius of the crane. 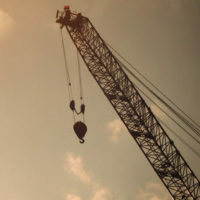 Many crane-related fatalities are a result of the cranes swinging into hazards such as power lines that lead to electrocution of the crane operators. Like the recommendations regarding trenches, both employees and employers can use the OSHA regulations for cranes to argue about their respective levels of negligence. Outside regulatory agency recommendations and regulations like those issued by OSHA can help build a case for an employer’s negligence if an employee is injured on the job. The experienced Boca Raton, Stuart, or West Palm Beach personal injury lawyers at Lesser, Lesser, Landy & Smith, PLLC can help you build your case based in part on these recommendations and regulations. Contact us today for assistance.